If you would have told me a year ago that we’d be uprooting our lives and moving west just a year and a half after building our first home, I would have laughed. But that’s the funny thing about life… it’s not always your plan because we plan and God laughs. In November, I decided I was ready to go full-time with Trendy in Indy. Sweet Olive became a brand client and my income was not consistent, but I felt like I was in a good space to be able to make it work. Then, just before the biggest season of the year in the influencer marketing industry, the great Instagram lockout of 2018 happened to Trendy in Indy (you can read more about that here). I lost collaborations, had to refund brands, and felt completely confused. I woke up in the middle of the night sobbing because I felt like I’d lost a big piece of who I was and what I’d spent years creating. Then, I’d feel ridiculous for crying over a platform that didn’t even exist 10 years ago. It was such a difficult season and one that made me question what I was doing with my life and where I wanted to go. Over the last couple of years, I’ve been creating my personal brand on a platform I have no control over. Social media is so great guys, but when we rely on this free platform that we don’t own to make us money, it can be detrimental to our businesses when things like this happen. Yes, I have my website and my email list, but influencer marketing relies heavily on Instagram and your follower count. As much as I wish that wasn’t the case and hope that this will shift, that’s how it is right now. I was starting to transition Trendy in Indy with content that would better serve my tribe through education because I realize that influencer marketing is shifting and I needed to stay ahead. I’d decided in October that brand consulting would dominate my business in 2019, but I was basically starting over in promoting myself as a consultant. I planned to accept only 7 brand collaborations per month making influencer marketing my second source of income. I have to be honest with you guys in saying that financially, we’ve been in a difficult season. I have student loans, we have car payments, a mortgage, and we wanted to start trying to have babies this year. Collin and I very much value feeling financially stable and being able to travel or go to dinner without having to worry. This change in my business was so scary for both of us because during that lockout, Trendy in Indy was basically on pause and I didn’t know what to do next. If you know my backstory, then you know that my family lost a business forcing my parents into personal bankruptcy and Collin went through that with me in high school. At that time, I promised him I’d never put us in that position. During my lockout, it was like I was having flashbacks and slipping our family into a situation that neither of us wanted to be in. I’ve worked with Closet Candy as an influencer since 2017. When I landed that first collaboration and needed shoot, Collin and I spent hours in the cold trying to get the perfect shots because I was so nervous. Closet Candy is an idol in the boutique industry and I knew I had to go above and beyond to create bomb content. Since then, I’ve been working with CCB doing try on sessions and helping to promote their presence in Indy. Chris and Chad own Closet Candy and have followed my journey for about two years. When my Instagram lockout happened, Chris texted me and said “you should just move to Phoenix to be our marketing manager” because she knew that my background was in marketing within the boutique industry. She was half kidding and so was I when I replied with, “I’m in.” After a few conversations with Collin and a lengthy phone call with Chris about what the position would entail, this opportunity became more real. Since Collin and I started dating, one thing we love to do together that fulfills us is hiking and camping. Any time we get to spend in the mountains is so precious to us and we love that we can share that. We’ve tossed around the idea of moving west and when this happened, it felt like God was giving us a window. We visited Phoenix in January to see if we’d even like the area because I’d only ever flown through the airport. Turns out, visiting Phoenix in the winter when you’re from Indiana pretty much guarantees that you’ll fall in love with the climate. We spent time looking at houses and I won’t lie, it wasn’t love at first sight. My vision of a modern farmhouse doesn’t exactly exist in the land of stucko homes and southwestern décor. Phoenix is also unique in the way that there are obvious pockets of good and bad neighborhoods, which is the case anywhere, but it seems so abrupt in Phoenix. What I did fall in love with was the team and atmosphere at CCB. Chris and Chad are building an empire. They work 7 days a week and I mean actually work. Some business owners would tell you that they work 80 plus hours, but they are never seen packaging orders or maybe even at the office at all. I value the fact that I’ve had the opportunity to actually live with Chris and Chad for two weeks and watch how hard they work. They offer benefit packages for their full-time employees, they opened their home to Collin and me, they give back to their community with a portion of their profits, and in general, they are just good God-loving people. The idea of being a part of their leadership team was so exciting to me because I knew this was an opportunity where I could grow and I could help CCB get to the next level. By February, Collin and I had decided that this was going to be the right move for us and it’s the prime time to do it with where we are in our lives now. Don’t get me wrong, I know this transition is not going to be rainbows and butterflies. Our family and friends are in Indy. We are moving somewhere that’s completely different than what we know in Indiana. We just built a home that I love. CCB has never had a marketing manager so we will be working to figure out how all the pieces fit together. But when we looked at the pros and cons, the good in this adventure outweighed the negative. So, what does this mean for Trendy in Indy? Almost everyone has asked this question so I figured it’d be best to write it out. The simple answer is, I’ll be figuring that out as I go, but my number one goal is to be a source of inspiration and positivity for you. 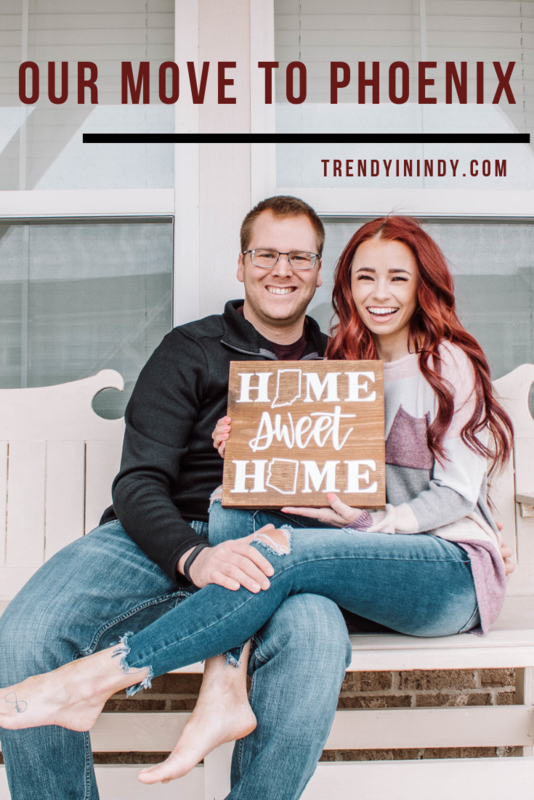 Trendy in Indy was initially created as a way for me to share my experiences with a loyal tribe through fashion, beauty, and travel so I’m looking forward to finding new ways to create. You’ll see a lot more fashion from Closet Candy, you’ll see more travel as we adventure out west, and you’ll see more hair and makeup tutorials. I recently launched my e-books and plan to come out with courses in the next year that teach you how to grow your brand. I’m going to continue to share my life in the very real way that I always have. No, I’m not changing the name of my brand. Indy will always be where my story started and as long as the Indy 500 is running and our families live here, I’ll be back at least twice a year for the race and the holidays. Also, Closet Candy has a store location in Indy so even that aligns with my personal brand. Some of you reading this might feel confused by this choice. Some of you might feel like I’m giving up on Indiana. Some of you might feel like I’m making the wrong decision. But here’s the thing, when you are making choices in your life, you are in the driver’s seat. The second you let the passengers who are along for the ride takeover is when you lose control. You’ll never reach your destination because you’re letting everyone else tell you where to go. I’ve spent many hours praying about this move, asking God to show me what to do. He’s worked through people in my life to guide me on this path. Collin and I made this decision because we know in our hearts that this is what is right for us. I appreciate your support and I hope you’ll continue following along on this new adventure with me. I deeply value the partnerships I’ve had here locally in Indy and you’ll always be able to find information on this great city right here on my blog. To those of you that have worked with me, I can’t thank you enough for giving me the opportunity to grow with you. I listened to a podcast today with Rachel Hollis and I want to end with this: “You have to get uncomfortable to get to the next level.” So this is me, leaving everything I’ve known to advance my career in marketing in a way I’ve dreamed of since I walked across stage at graduation nearly 4 years ago to the day.